The tourist complex Château Vartely is designed to be a perfect venue for both hosting the family events and meeting point of business people. If you want your wedding to become an unforgettable charming event, keep in mind that our team at Château Vartely Tourist Complex is here to help you do so. At the same time, if you wish to organize a private event or a more official gathering, whether it is a simple room reservation or a full organization of a conference, business meeting, training session, team building event in the open air or indoors, our Tourist Complex is here at your disposal. Our conference room is equipped with modern facilities and essentials such as LCD projector, flipchart, projection screen, Wi-Fi, DVD-player, and sound system with microphone. For the larger events or at the organizers’ request, all guests will have the possibility to dine at the restaurant of the Tourist Complex and enjoy many delicious meals. Also, during the break time the business event participants can enjoy coffee, tea, and juice with cookies and snacks, served either in the conference room, banquet hall or at the restaurant’s terrace. "Our stay at the Château Vartely hotel was a wonderful experience. Surroundings, rooms, meals - everything was at the highest level. The Tourist Complex has three villas that are used for guest accommodation, and each of these villas follows the style and the local spirit of the three regions of Moldova - South, Center and North part. We booked a room in the Northern Villa. It is a bit more expensive, but is well worth the money. The suite has two rooms, a lovely terrace, two bathrooms and a fireplace. It is a romantic and comfortable place. We did a wine tour with tasting that was very informative. Although it was different from other wineries, everything here was very nice and intimate. Initially we booked one type of tasting package, but later changed our mind and the winery staff helped us without making any fuss. We heartily recommend anyone to taste the ice wine, red wine from Taraboste line and the mushroom soup, just do not mix them"." "Château Vartely is a high-end place, and every staff member, whether the employee at the front desk or in the restaurant, is beyond praise. Meals are excellent, comfortable accommodation and wine tours at reasonable prices, accompanied with plenty of wine. I love this placeChâteau Vartely is a high-end place, and every staff member, whether the employee at the front desk or in the restaurant, is beyond praise. Meals are excellent, comfortable accommodation and wine tours at reasonable prices, accompanied with plenty of wine. I love this place"
"Very friendly people and a perfect place to recharge your passion for life!" "Friendly staff. Service is at the highest level. Excellent wines. Indescribable beauty!" 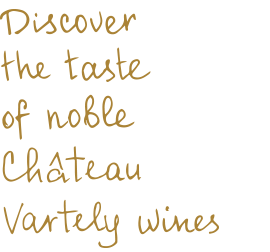 "Château Vartely and the team that works here create a pleasant atmosphere for us, in which we enjoyed the aroma of wine, produced by professionals! We learned a lot about production, storage and packaging of wine, which further improved our mood. You have a very tasty cuisine, which combines perfectly with ripe colors of sunset"
"I really enjoyed visiting Château Vartely and learning from Diana the details about the process of wine production. It reminded me, in some degree, of home, of Mexico. I will definitely come back! Château Vartely is one of the best places that you surely must visit in Moldova"
1. Free stay at our Tourist Complex for the bride and the groom, with a complimentary bottle of sparkling Brut Château Vartely supplied to the newlyweds room. 2. Late check-out and a complimentary Royal breakfast for the honeymooners.